An idea that could allow the Westside railyard expansion to happen, while also leading to the construction of a great community asset for residents. 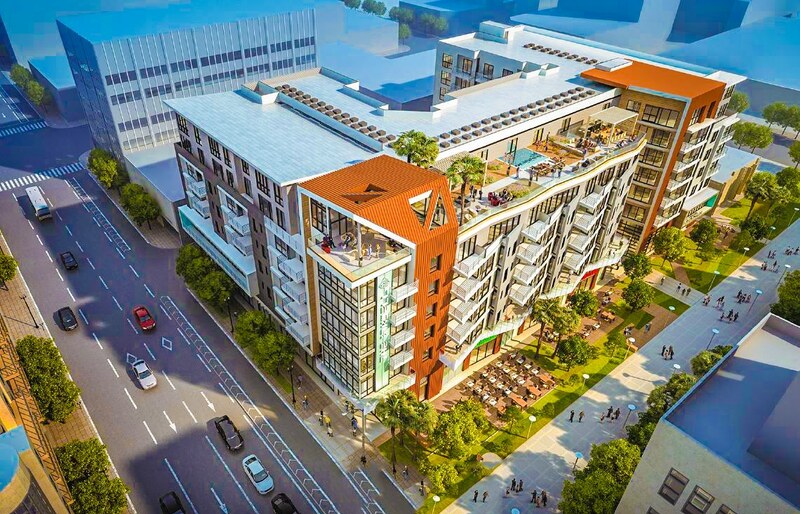 Love looking at renderings of upcoming developments in and around Long Beach? Click here for our full archive. Renderings courtesy of Raintree Partners. That opinion was given over five years ago and I still stand by it—but the obvious elephant in the small stretch of pedestrian living space was the largely empty surface lot just west of the Promenade at 127 E Broadway. Sure, it was host to some cool events. (You are very much missed, Promenade Beer & Wine Festival.) But it was largely a parcel of important but ignored space that could become something grander. Enter Raintree Partners, who presented to the Promenade Area Residents Association last night to discuss two projects, including their ambitious Inkwell residential project in that very surface lot. Reminder: this is just a proposal that has yet to be entitled by facing the Planning Commission let alone approved by City Council. It is unclear how many, if any, of those units will be affordable. Given the project hasn’t even hit the entitlement process, developers have no set date on when they will break ground as they continue to do community outreach in an attempt to further garner support for the project.